No instrument embodies the image of rock through the years like the guitar does and one only needs to look at the list of iconic figures in rock who were NOT vocalists to understand the star power associated with wielding an axe on stage. Yet when rock began the guitar was an afterthought, a barely used instrument in the rhythm section, a sound that was rarely highlighted while its players were the definition of anonymity. Before 1947 the electric guitar was not really prominent in any style of music outside of a select few who’d shown what it was capable of: Charlie Christian in jazz, Sister Rosetta Tharpe in gospel, T-Bone Walker in blues, Merle Travis in country and Les Paul in everything else. There were a few more of course, feel free to add a particular favorite of your own here if you want, we’re not leaving anyone out intentionally, but like any new wrinkle to come along in music it’d take awhile to firmly establish itself and prove that it was viable. The reason it was rather slow to catch on was due largely to guitars not being able to be heard clearly in crowded clubs. As blues guitar legend Jimmy Rogers said of those days, “when the people got noisy (your acoustic guitar) couldn’t cut through the noise too well“. By contrast the primitive electric guitars weren’t advanced enough and the amplifiers not reliable enough to trust. Add to that the fact they were relatively new on the scene which meant the current generation of performers hadn’t been raised on them and you can see why they were still somewhat of a rarity as the centerpiece of professional bands. Thus if you wanted reliability and consistency when it came to being heard over the din in a loud club it was best to stick with the brass instruments and a piano. But when technology improved over time and allowed for better amplification the guitar’s popularity rapidly increased in all styles of music. Wes Montgomery made his first recordings in 1948 and over the next twenty years revolutionized jazz guitar. Chet Atkins was getting his first shot as a country picker then as well and would go on to make a name for himself as the premier guitarist in his field. Around the same time in blues Muddy Waters broke through with a raw electric guitar sound that added to the edginess of his songs and he was followed over the next few years by Elmore James, B.B. 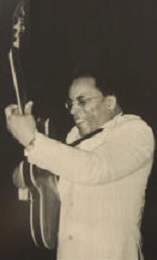 King and Hubert Sumlin, all of whom further expanded the instrument’s potential. Rock ‘n’ roll may have been even a little behind the times in this regard, as thus far we’ve just seen Tiny Grimes, Jimmy “Baby Face” Lewis and Billy Butler make the only real notable contributions to the guitarist role of the 80 or so rock songs released to date. But now all of them are about to take a back seat – if only briefly – to someone who barely hung around long enough to fill out the paperwork for his temporary position as a rock visionary. The roots of rock were far more situated with jazz than any other genre, if only because jazz was the most widespread of the non-pop styles that pre-date rock, and because so many of its earliest practitioners were jazz veterans. Usually though the ones who made the switch from jazz to rock did so because they hadn’t quite made much headway as bankable jazz artists. Joe Morris was one of the exceptions. His route to rock came about thanks to saxophonist Johnny Griffin, with whom he worked as member of Lionel Hampton’s crack band in the mid-1940’s. Though it should go without saying I’ll say it anyway – Hampton was merely one of the most important, innovative and successful jazz musicians of all-time and his band was a breeding ground for musicians who would further shape the sounds of the future when they went out on their own. Some, like Earl Bostic, we’ve already met. His replacement, Johnny Griffin was now itching to do his own thing as well and in December 1946 he too departed. But his time away was brief, he returned to Hampton in March 1947 in an attempt to talk his fellow horn player, Joe Morris, the trumpeter in Hamp’s crew, into joining him and starting their own band. Apparently Morris was having the same restless urges and so it didn’t take long for Griffin to convince him and in May 1947 the two of them left and set out on their own, only it wasn’t jazz they were going to play. After cutting their first session for Aladdin Records that went unreleased they landed a one-shot deal with Manor Records before signing with Atlantic where Morris would make his name, in the process propelling Griffin high up the list of notable rock saxophonists. Oddly enough Griffin wasn’t happy with this, he still preferred jazz when you got right down to it and after a few years “slumming” in rock Griffin returned to the genre he’d left behind, becoming a very well-respected jazz player the rest of his days. But it was with Morris in rock that he ironically scored the most acclaim. But his role in advancing rock wasn’t limited to only his own musical contributions, or even his coercion of Morris to jump into this realm. The other thing of note Griffin did was take along his high school classmate, George Freeman, who became the group’s first guitarist, a fortuitous turn of events that would have far-reaching stylistic influence if nothing else. It’d be hard to find a more prominent musical family than the Freemans. His brothers Bruz and Von were a noted drummer and sax player respectively, while his nephew Chico Freeman (Von’s son) was one of the more respected sax players of his day. All of them, it should pointed out, firmly ensconced within the jazz family. And that’s where George himself would wind up as well, releasing some very highly regarded work under his own name from the late 1960’s on. But where Freeman first gave notice that he was someone to watch was with Joe Morris and his signature moment took place on Boogie Woogie Joe, which heralded a new day in rock. They’d cut four sides in late 1947 for Manor Records, of which this was the strongest (The Chronological Classics CD series – pictured above and well worth the purchase – erroneously had them being laid down in 1946 but those dates are a full year off. All of the corroborating evidence, including Manor’s own sequence of their recording sessions, as well as Griffin’s detailed timeline surrounding the events that led to he and Morris going out on their own shows that it was indeed late fall 1947). Manor wasted no time in issuing this on the heels of Morris’s first Atlantic noisemaker, Lowe Groovin’, a song which it should be noted that Freeman reportedly had more input into writing than he was given credit for. On Boogie Woogie Joe he gets no official credit in that regard either but while the structure of the song may indeed have been Morris’s work, the truly memorable parts are something that only George Freeman could’ve contributed. In short, he offers up the first scintillating guitar workout in rock history. The song’s framework itself may be standard fare for the time featuring a rousing massed horn intro, some perfunctory lyrics delivered by Morris (in a rare vocal turn) touting himself and the music with fairly generalized plaudits which only mean to serve as a way to ground the extended musical jams which follow, notably Griffin’s extended sultry sax workout 2/3rds of the way through that gets more unhinged as it goes along and is followed by Morris’s blaring trumpet call and response with the others as it leads to the fade out. As songs go its certainly suitable in theme, structure and outlook for rock’s aesthetics of the time, very capably done in every regard, but it’s still nothing extraordinary… EXCEPT for Freeman. That’s where this separates itself from everything else out there at the time. Freeman’s performance from the moment he enters the picture following the horn intro, is electrifying. His playing crackles with energy, not to mention an ahead-of-its-time buzzing distortion that gets more prominent as it goes, which only shows that nobody manning studio controls knew what the hell he was capable of, or indeed may not have known what the electric guitar itself was capable of if played by someone not content to merely strum a few muted chords in a half asleep going-through-the-motions type of performance that was standard operating procedure at that juncture in all types of music. There’s no chance of anyone being half asleep here as Freeman ramps up the energy with scalding single string runs that gives the entire song a jolt of electricity and an almost palpable feeling of danger. This wasn’t something you heard everyday in 1948 no matter what music you listened to. Though the song itself is pretty basic otherwise, Freeman’s parts sound as if they were dropped in from outer space. Again the key word here is context. In the context of rock circa 1958 or 1968 it would barely draw attention to itself as a sound, certainly his playing is as skilled as anything from those days, but the feeling it elicits would be more at home then and wouldn’t stand out. But in 1948 this was otherworldly in concept. Nobody had thought to feature a guitar so boldly in this form of music before, but someone had to try it and see if it could add something notable to the sonic textures rock was developing. Freeman proves that it clearly does that and more, giving the song its energy and its most distinguishing – and appealing – feature. His backing licks behind the horns in the second and third breaks add immeasurable tension, the two soloing instruments vying for control of your ears. When Freeman steps aside for his childhood pal Griffin you get the sense it was more out of courtesy as much as the arrangement itself, almost as if he’d kept going he might’ve sent Griffin, no slouch himself, to the hospital if he’d tried to keep up. When Freeman jumps back in with a jagged sounding riff the whole performance takes a giant leap up in intensity and everyone involved had to sense that this was no mere novelty, but rather that it was something truly ahead of its time. It may have taken a few years for others to pick up on it and take it from there but by the time the likes of Goree Carter and his fellow deviants enter the picture it’s clear that the mindset Freeman introduces on Boogie Woogie Joe has found its way into the attitudes of more guitarists who will take the next step in the instrument’s quest for total control. Ironically Freeman wouldn’t stick around very long to get the acclaim due him when rock began utilizing his stylistic precedents in the future. By the fall of ’48 he’d leave Morris’s band and get off the road altogether to stay around his home base and raise a family, playing locally and inspiring all who heard him, even if it was only in passing. Eventually he’d make it back into the spotlight as a highly acclaimed jazz guitarist but his scorching rock sides that set the prototype for much of the advances to come would be known to only a few. 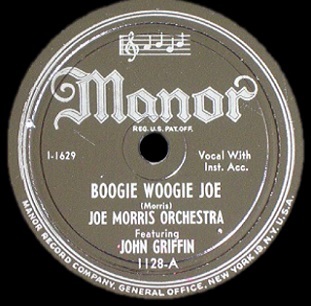 As for Boogie Woogie Joe that first showed what he, and the instrument, were capable of in the right hands, it came and went without eliciting much interest as Manor Records didn’t have even the commercial means that start-up Atlantic did (which got Lowe Groovin’ played on a popular D.C. radio show by naming it after the dee-jay) and its total lack of sales further obscured the innovations contained within over the ensuing years. But for those who WERE listening here’s where the rock guitar started in earnest, not only the licks themselves but the attitude required to pull it off. The fidelity of the recording is a little scratchy and the stop-start arrangement conflicts with the excitement generated by sapping its energy too much when he’s not featured, but during those moments where Freeman is going wild you forget all that and it becomes a little bit easier to let yourself be carried away by the sounds of tomorrow. Leave a reply on "Joe Morris: “Boogie Woogie Joe”"